Every now and then Knoxville reminds me that it’s slowly changing, one example is my new found obsessions: Chocolate Bacon Chocolate-Chip Cookies, that’s not a typo. A couple of days ago when forced by gun-point to go into my favorite local coffee shop, Coffee and Chocolate, I found the controversial cookie. Never before that point had I described a cookie a controversial, but this one is. I had to get it and flaunt around my new discovery. Reactions were mixed, “Gross! Please don’t get that”, to “Hummm.. let me know how it tastes”, and that’s exactly what I did. I cautiously took one bite at a time, making no rushed opinions about the cookie. I found that the sweet and savory paired well together and also nicely complimented my morning mocha. 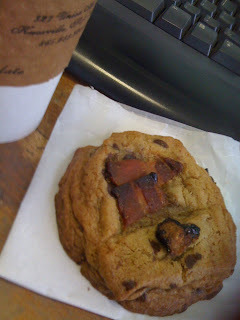 My excuse for eating a cookie at 9:00am was it has bacon which meant it could be eaten before noon. My only suggestion is to make the cookie with lean bacon; the fatty texture can be a little weird combined with the cookie texture.